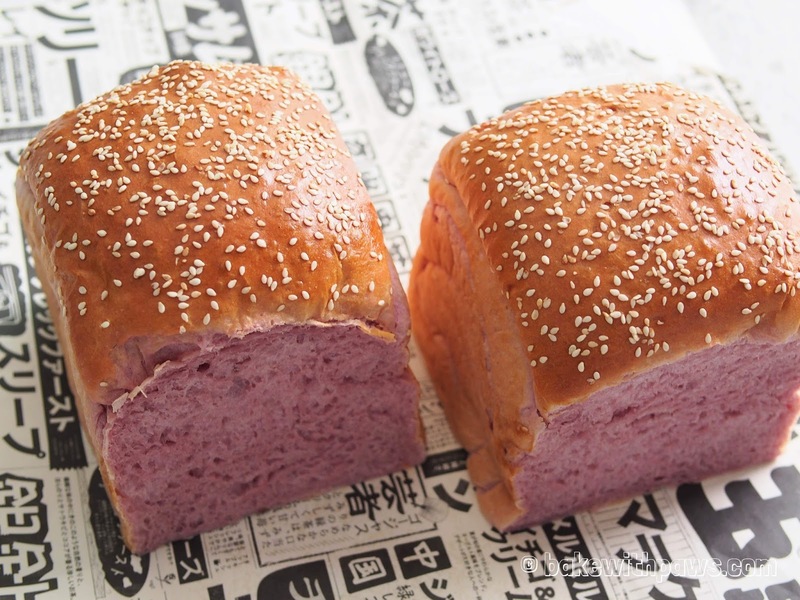 I made this Japanese Purple Sweet Potato Loaf for my step-daughter when she was back for summer holidays recently. I have made her few different breads but this is her favourite and she always requests this particular bread. I used the same recipe of Japanese Purple Sweet Potato Buns I shared sometimes ago. 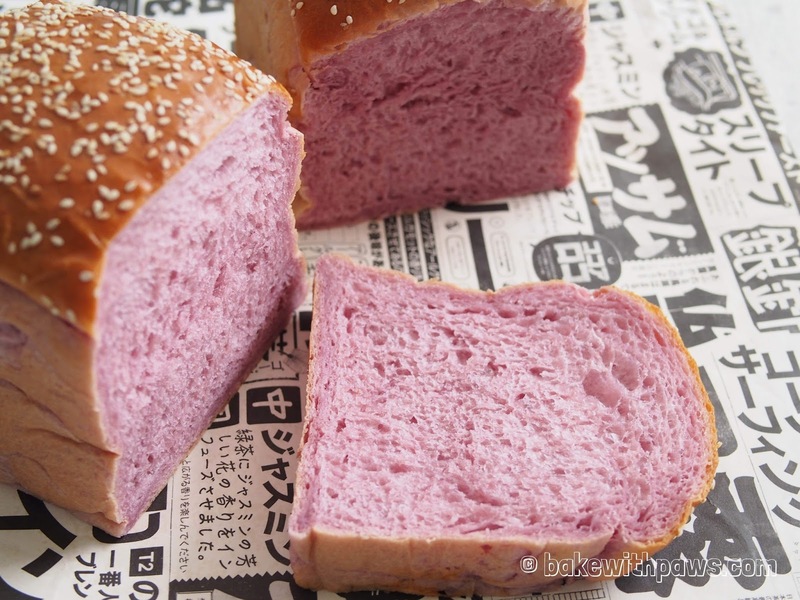 Put all ingredients (first add salt, flour, sugar, yeast, butter, egg, mashed potato and lastly fresh milk) in a bowl of stand mixer and knead till the dough come together, until achieve window pane stage (the dough at this stage should be able to be pulled and stretched into membrane). It takes around 10 to 15 minutes at medium speed. Please add 120g of fresh milk first then slowly add in if the dough is too dry. Form the dough into a round ball and let it rise in a warm place for 1 hour or until double in size in a large greased bowl, covered with cling film or kitchen towel. I normally leave the dough in the stand mixer’s bowl and cover with kitchen towel. Transfer the dough to a clean floured surface then divide into 2 equal portions. Roll out each dough with a rolling pin into rectangle shape. Roll up like swiss roll until a short log is formed. Place bun onto the baking pans lined with non-stick baking paper. Let it rise for another 45-60 mins or until double in size. Bake at pre-heated oven at 180C (160C fan mode) for 30mins or until golden brown. If fresh milk is not available, you may use 120g - 150g water + 2 tablespoons (20g) of full cream milk powder. Does it matter if i put in all the ingredients including the milk together? Thank you for dropping by. It is ok to put all the ingredients together. But, please don't put salt and yeast together. Please follow the sequence in Step 1. From my understanding, the salt will kill the yeast if they contact directly. Sorry to hear that your sweet potatoes loaf not successful. It could be many reasons, yeast expired or too much salt or not warm enough? I normally leave my dough to rise inside the oven (door close and off) with a bowl of hot water beside. Thank you, Irene.. Good luck and let me know ya..